Use with 3/8" Drive Air Hammer. Stemmed, tool steel stamp holder inserts into the air hammer. 3/8" square base holds any standard single 1/4" square metal stamp or custom stamps modified by us to a 3/8" shank. Use with 1/2" Drive Air Hammer. Stemmed tool steel stamp holder inserts into the air hammer. 1/2" square base holds any standard single 3/8" character stamp or custom stamps modified by us to a 1/2" shank. 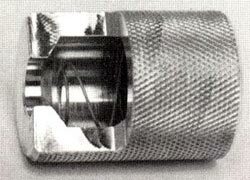 Knurled, aluminum retainer is threaded and screws on to secure die holder in the air hammer. 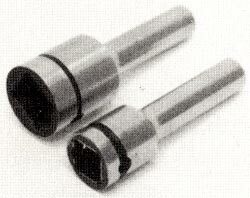 Specify either 3/8" or 1/2" retainer to fit your E-Z Stamp Air Hammer. Additional retainer springs and O-rings also available on request.